Happy Sunday my Friends. 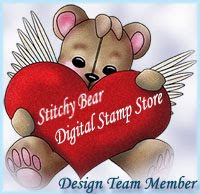 Here is my DT card at One Stitch At A Time challenge blog. I was lucky to work with this gorgeous image "Friends Forever" by Dellicious Doodles. You can perches this digital image HERE. I colored image with Distress Ink pads, and added Glossy Accents to the eyes. Isn't she lovely? I hope you all will join us for this challenge. Have a wonderful day all. Now i need to get on the Phone and wish my sister a very Happy Birthday. Oh my...what a wonderful creation...and your colouring as always is amazing. You coloring is amazing and i love the little boot embellishment!! Great shading and colouring Nataliya. Hi there Nataliya - this is such a wonderful card and I love how you have coloured the image in. The cowgirl boot is such a brilliant touch on the gold ribbon!